The pubis is one of three bones (pubis, ischium, ileum) that comprise the pelvis of vertebrates. 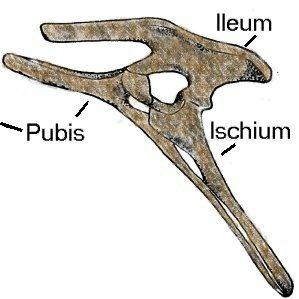 Because hadrosaurs are ornithischian (bird-hipped) dinosaurs, the pubis projects backwards parallel with the ischium. Together the three bones comprise the mechanism for transferring motion from the leg to the body. In the human body these three bones are fused into a single pelvic girdle. Shown here are a generalized ornithischian pelvis (right) and a pubis of Edmontosaurus (left). 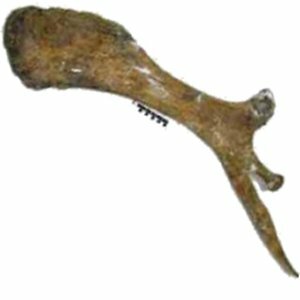 This bone is 1.15 meters in length (nearly 4 feet). The human pubic bone is less than half a foot in length.